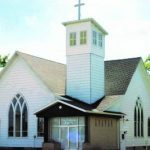 Peace is a smaller church that was founded in the village of Tilleda when a number of German Lutheran families started gathering for worship in area homes, led by a traveling minister. On February 9, 1907, the heads of 16 families met and 10 of them signed a constitution as charter members, which formally organized St. Peace Evangelical Lutheran Church. Early church members donated land and mortgaged their homes to build a church. The building, the altar, the pews, and everything inside the church were handmade and finished by the people. Peace Church was formally dedicated on January 26, 1908. The cemetery was added in 1909 and the congregation called its first pastor in 1912. Over the years, this congregation has grown in faith, hope, and love, working together to enrich all the members of God’s family. Peace Lutheran has been the backbone of this community, filled with dedicated, committed, and faithful people of God. Together as members and friends, we are encouraged to serve God in this world by worshiping together and participating in meaningful ministries. We strive to provide positive and uplifting programs for the area and to serve all those who are in need. Peace is a church of fellowship, of service, of enriching programs, of creative worship, and most of all, a people who care. We invite you to come and worship with us, the people of Peace. ~Services are held each Sunday at 9:30 am. ~Peace provides educational opportunities for people of all ages. ~Sunday School is for those 4 years of age and up. Classes run from September to May and are held each Sunday at Elias Church from 9:00 am to 9:45 am. ~Peace Altar Guild faithfully prepares the Lord’s Table and sanctuary for worship and celebration. They are responsible for the care of all our banners, altar paraments and communion supplies. They also decorate the church for various holidays and special events. ~Peace Brotherhood is a fellowship group for all men, including spouses. They meet on a monthly basis to socialize and plan their events. Each year they sponsor a Potato Pancake Dinner at the Tilleda Community Hall to raise funds for projects they sponsor within the church. ~Peace WELCA (Women of the Evangelical Lutheran Church in America) is a well-established organization in our church, offering an opportunity for all women to become involved in the service of caring for the church and its congregation. The WELCA meets monthly for Bible study and fellowship and they are active in the community and at the local synod level. Quilting each year is a big project of the ladies, including gathering many items for Lutheran World Relief. ~Peace Cemetery Corp: The Cemetery corp has guidelines and fees for their cemetery. Please click the Cemetery Letter and feel free to contact someone listed in the letter if you have questions. ~Peace is a church with a focus on mission. From this small rural congregation we support two missionaries who serve with Lutheran Bible Translators. We regularly support Lutheran World Relief, World Hunger, Lutheran Social Services, and our church food pantry. ~Peace is a church that sings, enjoying many of the old favorites. We are also blessed with 2 organists that provide us with inspirational music that makes our worship complete.